I don’t know if I said this before but, I really like salads. I am not a vegetarian or vegan or whatever these guys call themselves but somehow I always had a weakness for a good salad. Probably is something left over from my childhood when parents always bug you with the darn greens, who knows, the fact is I always try to find new recipes and if I cannot then I use my imagination. Now, during one of my weekly incursions to our local grocery store I found a bunch of recipe cards and this interesting salad caught my attention and I decided to give it a try. Half fruits half greenies, might sound like a weird combination but the watermelon, kiwi and spinach in a salad really work. Enjoy! 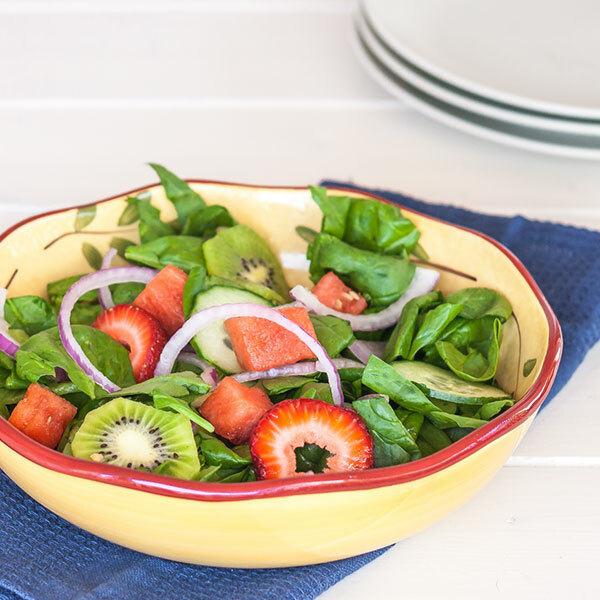 In a large salad bowl combine spinach, watermelon, kiwi, cucumber and onion. Drizzle with vinaigrette; toss well to coat. Server immediately.